People who are enthusiastic about the space missions. Also, teachers and parents whom would want to introduce these topics to children. We aim to provide an exploratory visualization system of space missions that helps people explore and learn numerous interesting facts in the space trips. We also hope to raise an interest in space travel for people again. 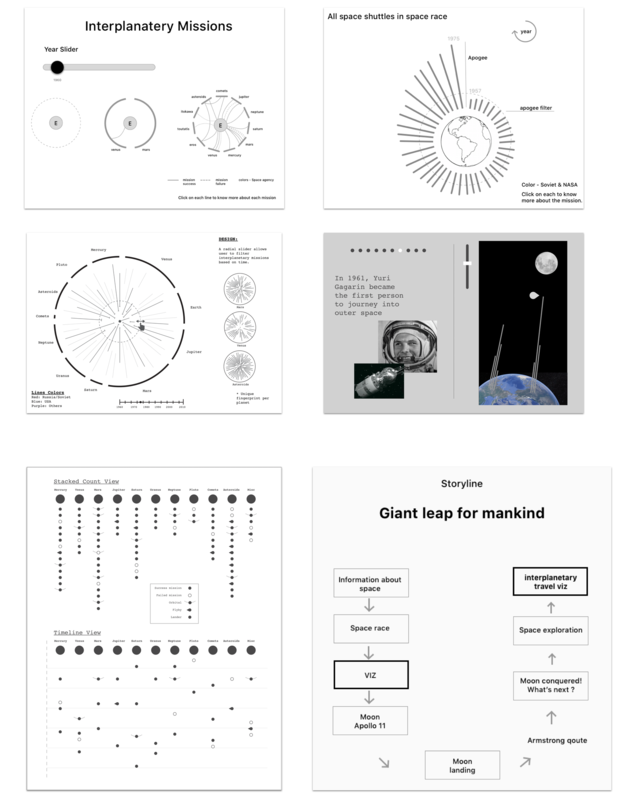 We use a scrollytelling approach to tell the birth of space travel & the space race. 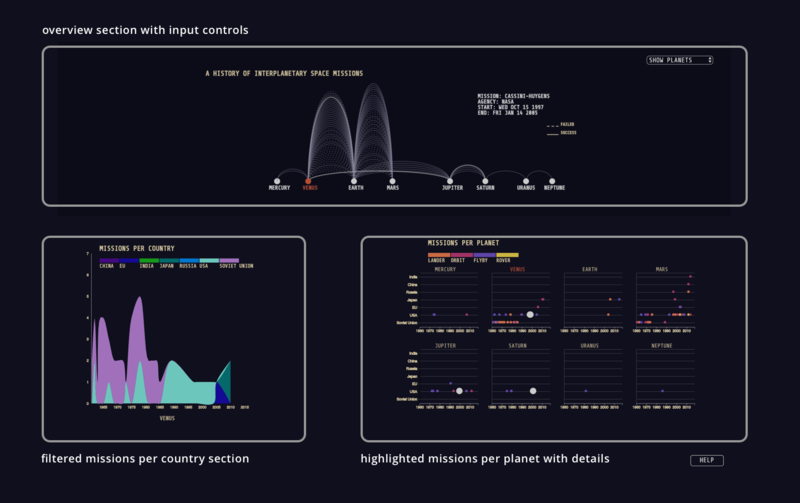 At the end we provide an in depth detail of all the interplanetary missions that users can interact with to get more insights through its various variables. As someone who has been fascinated with space travel, I found this dataset of all interplanatary space missions which ended up being our primary dataset. 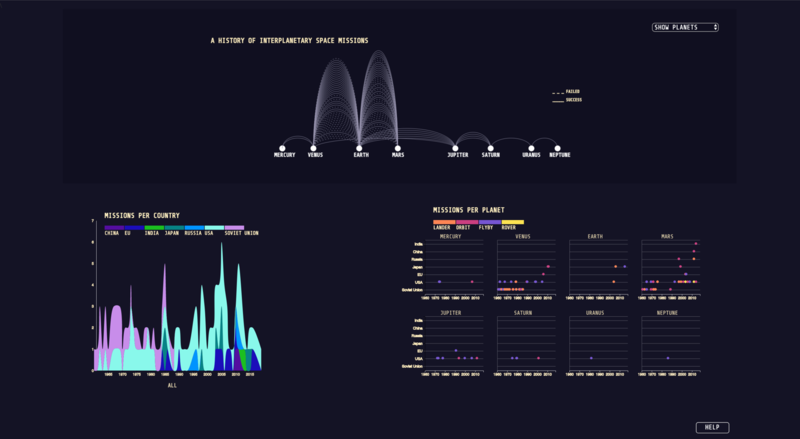 We decided to focus on the space-race as introduction to our viz and due to lack on any single dataset, a couple of my teammates created the following dataset by combining data from multiple sources. Middle and High school students who are interested in space missions. Teachers and parents whom would want to introduce these topics to children. Researchers who are interested in space mission data. 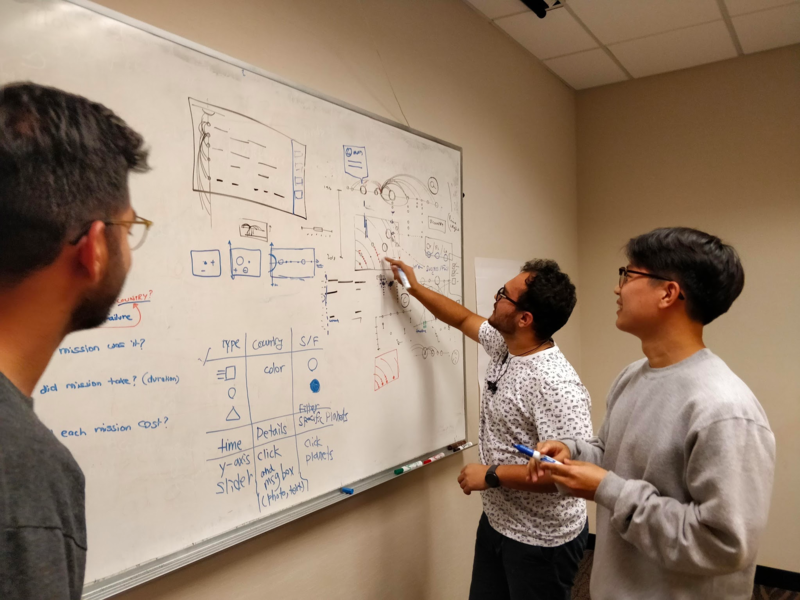 The key feature of the target audience is the mixture of novices and experts, which requires the design to balance easily understandable visualization and in-depth space missions knowledge. Getting a brief understanding of when the space travel began? when did interplanetary travel start? What were the reasons for these missions ? Gain more information about space missions. Identify the firsts in space travel. Get answer to questions like first person in space; first death in space; first animal in space; first human on the moon. Are there any trends over the past years in terms of different missions based on the destination planet, country, type of missions etc. If yes, what do the trends look like and how noticeable are they? Compare different missions based on mission types, destination, multi-hop or single-hop and other parameters. 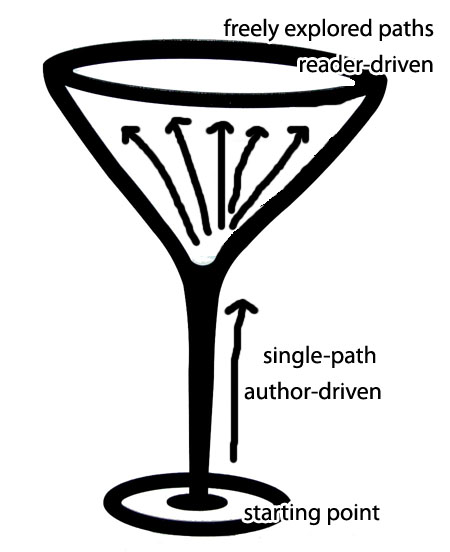 The team first diverged to brainstrom and roughly sketch out concepts. In this phase, I focused on efficient usage of the multiple attributes in an overview visualization. These are some of the sketched I made at this phase. After more brainstorming sessions post the initial sketching and getting feedback on the ideas, I turned some concepts into medium-fidelity design for an in-class design feedback session. After getting feedback on our initial design, we went through another round of iteration to create the following designs. 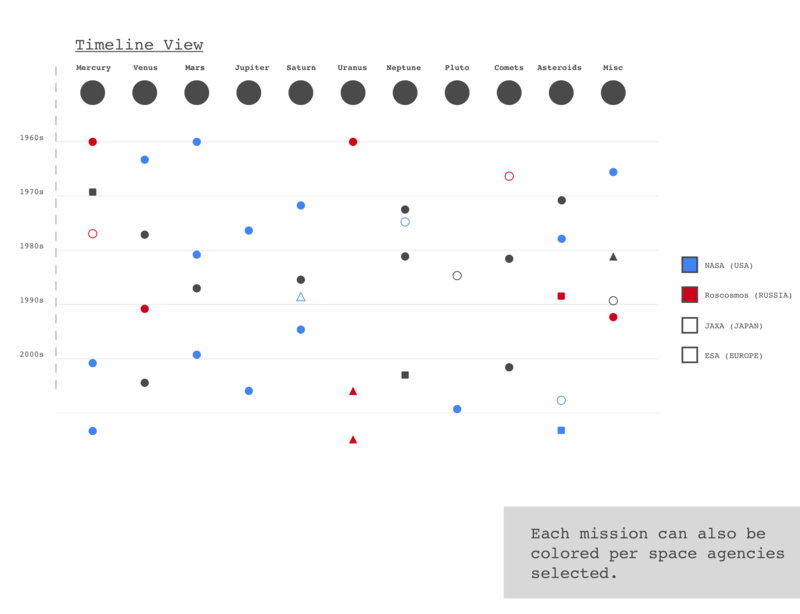 The scrolley-telling part needed more refining as it has to convey milestones in the space race and for the interplanetary missions, the single view was not doing justice for the rich dataset and did not insite more interactions to drill down for details. I initiated and led a couple of design sessions to iterate further on our design by incorporating the feedback received in previous rounds. We looked at multiple space data visualizations, Sci-Fi movie posters and Nasa documents for inspiration. One of our teammates found the Share Tech Mono typeface which we selected as we thought it was coherent with the overarching theme. Representation and interaction are two equally important components of an information visualization. While designing interactions, I kept in mind that each interaction has to tie back to the user goals and add value to the entire experience. 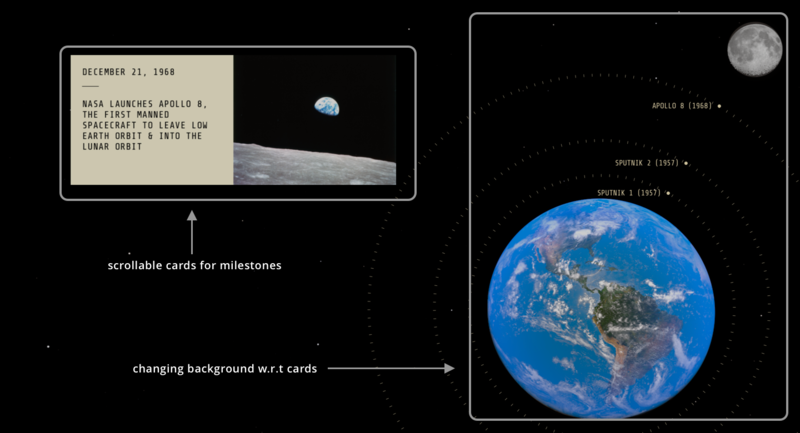 Interaction 1: Scroll down to see milestones in space race and get to the main viz. Interaction 2: Chose between all celestial body view or only planet view. Interaction 3: Hover on arcs for mission details. I am proud of how Beyond Infinity turned out and enjoyed the entire process that brought us to the final version. 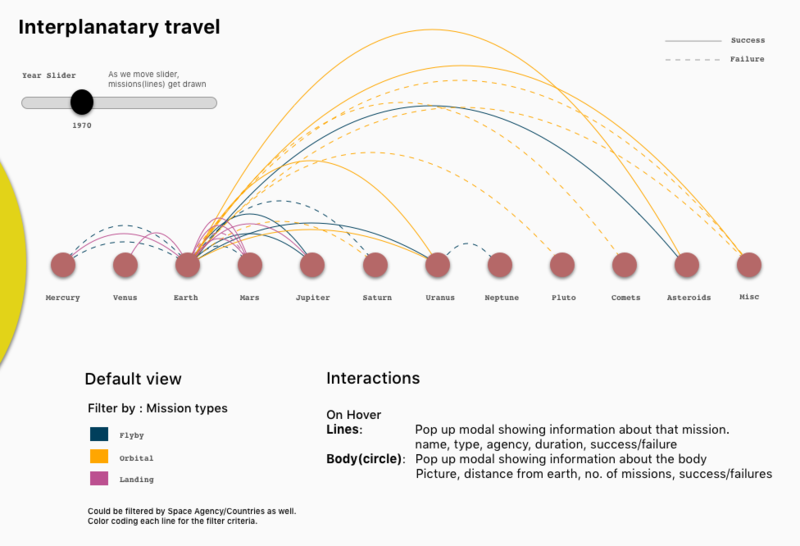 Unlike other apps or websites, Beyond Infinity broadened my horizon to the field of information visualization where I got to learn and apply some domain-specific principles. While designing the scrolley-telling as well as all the interactions, we started coming up with numerous concepts that were unnecessary. Many of the interactions were thought of to make it look visually polished or mask more data underneath. That started swaying the project and hence we stuck to a strong goal-driven process which entailed adding interactions only to fulfil a specific goal. 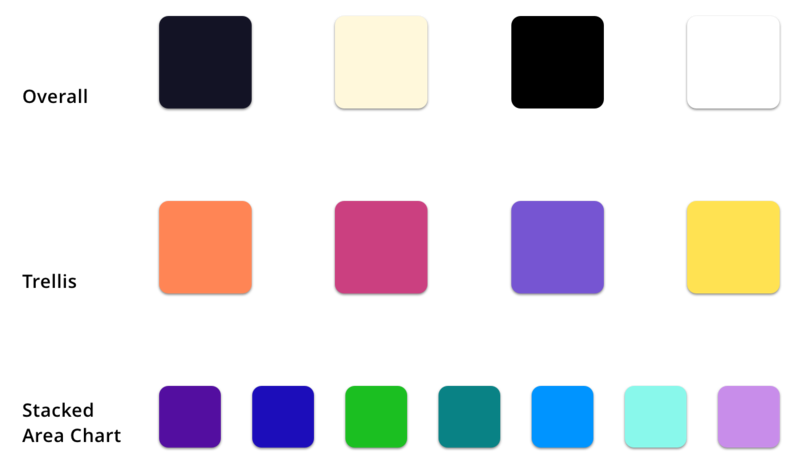 We went through many iterations to finalize the colors for the different elements in the visualization. We tried to strike a balance between elegance and utility, giving utility a slight edge. The planets and celestial bodies were arranged exactly to scale with respect to their distance from Sun. We thought of making the planets equidistant from each other to make it look uniform; but we decided to show the actual scale as we didn’t want the viz to be misleading. 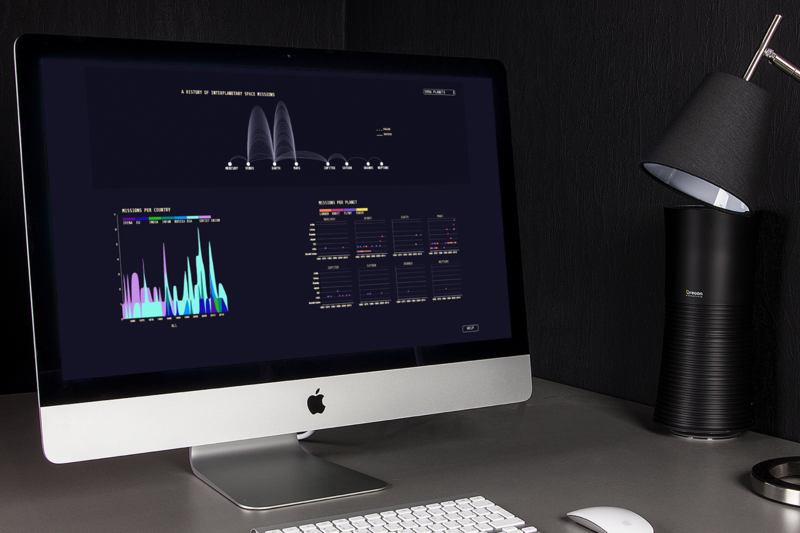 In a team of two designers and two developers, I was mainly a designer for this project but I ended up coding some aspects of the visualization and made the scrolley-telling part. My dev background helped me to communicate better with the developers which is precisely why we were able to go through many iterations.